Description: One size fits all. Perfect for travel. Helps you sleep better naturally. Soft, comfort padded, lightweight. Adjustable-one size fits all. ..
Calypso Insect Repellent Roll-on Gel (CALB05). Repels mosquitos, horseflies and other biting insects.This is specially formulated to give protection from mosquitoes, midges and biting insects. The f..
Our specially formulated insect repellent spray contains DEET and repels mosquitoes, midges and other biting insects. It provides up to 8 hours protection and can be used both at home and abroad. Unl.. Description: Relieves nausea caused by: Flying, Boating, Driving, Morning Sickness, Chemotherapy, Anesthesia Gently exerts pressure on acupressure point One size fits all .. Description: Mosquito repellent tablets For use with our 'Mosqui-Go' diffuser range Each pack contains 30 tablets Each tablet lasts 8-10 hours & treats 30 cubic metres of space Up to 30 ni.. Description: Medically proven mosquito bite relief Uses Piezo-Electric technology Reduces swelling & itching 100% Natural & non-allergenic .. Description: Soft & comfy BODY pouch Protects passports, money & other valuables Designed to be worn under clothing Unisex styling .. Description: Combination cable lock Steel cable attaches to any secure fixing Keeps multiple bags secure Easy to set using a code of your choosing .. Description: Revolutionary calendar luggage lock Set using any memorable date Use with birthdays, anniversaries or special occasions Secure 5 dial design .. 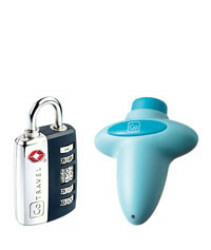 Description: Combination padlock with extra large dials Reliable 3 dial design Easy to set using a code unique to you No keys to lose .. Description: Mosquito repellent refill bottle (30ml) For use with our 'Mosqui-Go' diffuser range Emits a bite preventing vapour Lasts for up to 37 nights (12 hours/night) Treats 30 cubic metre.. DESCRIPTION : accepted key lock with inspection alert indicator Supplied with an 'alert' reset key & 2 padlock keys Solid, safe & secure Fits most zipped luggage .. Description: Solid brass luggage lock Supplied with 3 keys Solid, safe & secure Fits most zipped luggage .. Description: This easy to carry cup is ideal for purses, backpacks, briefcases and drawers. Great for traveling! Cup comes inside a small storage container. Open lid, pull sections up and cup is r..